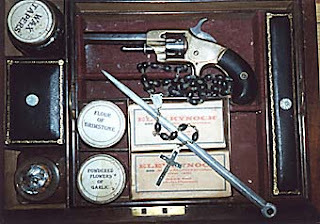 The photo above shows a work of art by Dominic McGill, but there are many vampire killing kits floating around these days whose owners or sellers claim they're the real deal. Most of the kits were supposedly assembled by a mysterious Professor Ernst Blomberg in the 19th century. One such kit, which was auctioned off in 2003, included the following instruction label. This box contains the items considered necessary for the protection of persons who travel into certain little known countries in Easter Europe where the populace are plagued with a peculiar manifestation of evil, known as Vampires . . . The items enclosed are as follows . . .
8. Professer Blomberg's New Serum"
Apparently, very little is known about Ernst Blomberg. 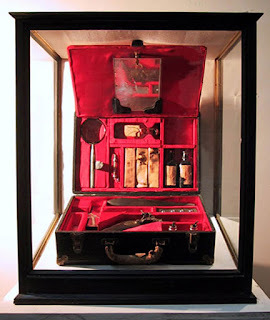 But many experts have speculated that his vampire killing kits, such as the one shown below, were actually assembled in the 20th century to capitalize on the success of Bram Stoker's novel, Dracula. But by far the most unusual kit is the one displayed on the Museum of Supernatural History's website. It's said to contain a pistol that has not only dispatched countless vampires and werewolves, but also Jack the Ripper and Adolf Hitler. Hmmmm. See the kit and the miraculous firearm here. omg! sorry i have not been here my rent grounded me from computer. By the way how much do those kits cost? I want 1!!! can i borrow one of those? i need to get at edward.